The Requiem Mass and celebration of the life of Eugene (Genie) McAree, Luton, England, and Drumcoobrady, Tydavnet who died on Wednesday 20th June 2018, took place at Our Lady Help of Christians, 52 Castle Street, Luton on Thursday 5th July 2018. Predeceased by his son Michael (d March 2012), he is sadly missed by his loving wife Maureen, and his daughters Theresa, AnnMarie and Trish, and the extended family circle. The celebrant for the Mass was Fr Dariusz Bialowas, Parish Priest at Our Lady Help of Christians in Luton. A number of relations and friends from the Tydavnet area travelled to the funeral, and Fr Bialowas commented on the huge turnout for Genie’s final farewell. Genie’s cousin John Sherry read the First Reading, and niece Mary Healy proclaimed the Responsorial Psalm. The Prayers of the Faithful were read by Amanda (McAree) Meehan, cousin; Patsy Brady, nephew; and Donal O’Keeffe, nephew. 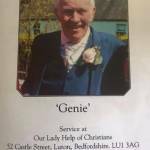 Genie’s sister Bridie Teevan and his niece Marie O’Keeffe participated in the Offertory Procession. A touching eulogy was given by Trish McAree, and his links with Monaghan continued with Big Tom’s hit “Back to Castleblayney” providing the backdrop as Genie was taken to his final resting place. It’s a devastating day for the family to say “Farewell” to a dear husband, Dad, and friend – but the Mass booklet, family photos, and stories recounted, gave a rich insight into his life, his interests and his final illness borne with a strong faith and great fortitude. Genie lived for his family, and his grandchildren when they came along were the light that lit up his life. He will be deeply mourned by many, especially all the immediate family. Here’s a lovely tribute penned by Genie’s cousin Amanda McAree……. Way too soon God called and he had to go. Learning to read and to write and in the school yard he’d play. It’s very sad when good friends from this life must, from us, depart. Were always guaranteed to bring a smile to his face. That we spent in your company, “You were some cowboy”! !